Ulmus pumila.Elizabeth J. Czarapata.dnr.wi.gov. (Accessed 6/2014). Ulmus pumila is a tree to 25 m tall, sometimes shrubby, bark rough, twigs slender, gray-green, hairy when young, branches brittle, tending to break, winter buds round, large, 0.6 cm wide, blackish, scale margins hairy. Leaves alternate, elliptic, 2-7 cm long, size very various on one twig, leaves near twig base often much smaller than those near tip, leaf tip pointed, base almost equal, margin toothed, teeth mostly simple, dark green, smooth above, smooth below when mature. Fruit dry, 1-seeded, flat, almost round, to 1.5 cm diameter, notch closed (Rehder 1986). N. E.
Habitat: Escaped from cultivation. Tolerates soil pH 5.5-8 (USDA, NRCS 2010). Notes: Weedy, invasive into natural areas. Wood brittle, breaks easily in storms. 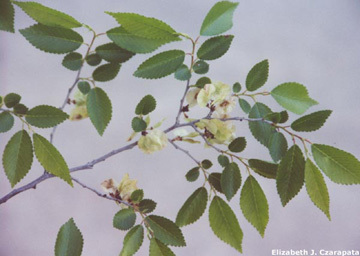 Resistant to Dutch elm disease and phloem necrosis, foliage attractive to many insects (Dirr 1990). A host tree of the Asian longhorn beetle, Anoplophora glabripennis (see Norway maple). Stressed trees found with spindle galls on shaded leaves.